What is this country called? Things the British do well, things that define the place, things that you should be able to find quite easily near to wherever you are visiting. A World class gallery or museum. A place outside of London. A performing arts event, theater, concert, festival. Fish and chips - preferably by the sea. Other stuff - Listen to the radio. You can experience the majority of things on this list almost anywhere in the UK or en-route to somewhere else. London is picked out as a specific destination as most visitors to the UK spend some time there. I use Google Maps on my smartphone to find nearby places, get it for Android or iPhone. Here in the UK, you will almost certainly get wifi at your accommodation and many other hotspots around the country including many trains and buses. You can easily buy a SIM card to access roaming internet for a price that won't stretch you too far. This allows you to search for what you want near to where you are with recent reviews too, very useful as businesses open and close, improve or decline with time, so that recommendation you read about online or in print may be out of date by the time you are travelling. UK SIM cards for visitors. A world class gallery or museum: there are many to choose from within a small area of London and something that will interest just about everyone. These are the most visited, there are others too. The Natural History Museum South Kensington, London - just a short walk away from the Science Museum and the Victoria and Albert Museum. British Museum - the history of mankind, Rosetta Stone and Parthenon Sculptures. National Gallery - European art from mid 13th century to 1900, Turner, Van Gogh, Caravaggio etc. Tate Modern - international and contemporary art in a former power station. Natural History Museum - the natural world., dinosaur skeletons and life sized whale models. Science Museum - contemporary science and the history of science. Victoria and Albert Museum - art and design including fashion, jewelry and furniture. Tower of London - 1,000 year old royal palace stuffed full of history, not cheap but good value. Royal Museums Greenwich - Royal Observatory Greenwich (free), historic sailing ship Cutty Sark (pay), National Maritime Museum (pay), Queen’s House art gallery (free). Buckingham Palace - not a museum as such as it is very much used for state occasions and visits, open late July to end of September. London: I can't imagine coming to Britain and not going to London, a world class city stuffed full of just about anything you could want to see or do. It is going to be expensive, but you knew that anyway. London - mmake sure you go here ...and make sure you don't just go here, but go other places too. Outside of London: Great as London is, it is a pretty unique place in England and the UK and rather unlike the rest of the country. Make sure you get away for a while, if not for a significant proportion of your trip, then at least for a day or two to see what the majority of the country that isn't London is like. The coast: The seaside holds a particular place in the psyche and affections of the British, 70 miles is the deepest inland you can get here before you start approaching the opposite coast, from a young age a trip to the seaside is a summer treat, for the day or longer. There are coastal towns that are vibrant and thriving, some that are cheap and cheerful, some that are in decline and some that are rather gentrified. There are sandy beaches, rocky coasts and cliffs, sometimes all close together, there will always be fish and chip shops, maybe a pier or harbour wall to walk along and some form of entertainments. Britain has a lot of coastline over 11,000 miles (depending on how you measure it) and it's never any further than 70 miles away. The countryside: Britain does countryside well, it's mostly rolling hills and bucolic views, there are some wilder parts too that you could seek out. Stay in a National Park or at the very least see it from a train. Green, it's very green, often very, very green. Pubs: There are so many, there will always be one you will like which won't necessarily be the one with the best reviews. The good thing is that having a drink is not a particularly big investment in money or time (less than a meal) so if you aren't so keen, then move on to another. While you're walking around in the day, take note of nearby pubs you might like to call in on later on. Watch out for major sporting events such as football or rugby matches when the pub may fill with fans, you may consider this a good or bad thing, you might be on holiday but you can still find your "local". Supermarket: Bit of a personal thing here, I am fascinated by supermarkets whenever I go abroad, they give a great insight into how ordinary people live. There's also puzzlement at those things that are really cheap back home that are really expensive here and those other really expensive things back home that are so much better and loads cheaper here, how many can you fit in your luggage? will they keep? An ancient university city: Britain is home to two of the world's most famous universities, Oxford and Cambridge, known collectively as Oxbridge. They are both very old dating from 1096 and 1209 respectively and both have lots of impressive architecture that has been added to over the centuries, the old buildings are in daily use as living parts of the university. Which one you should visit depends on what is convenient, Oxford is on the way to the Cotswold's, Warwick and Stratford-upon-Avon from London while Cambridge is on the route to the north. Cambridge is easier to reach from London for a day trip, 50 mins on the train, it's also my preference, though I'm biased as I live nearby. 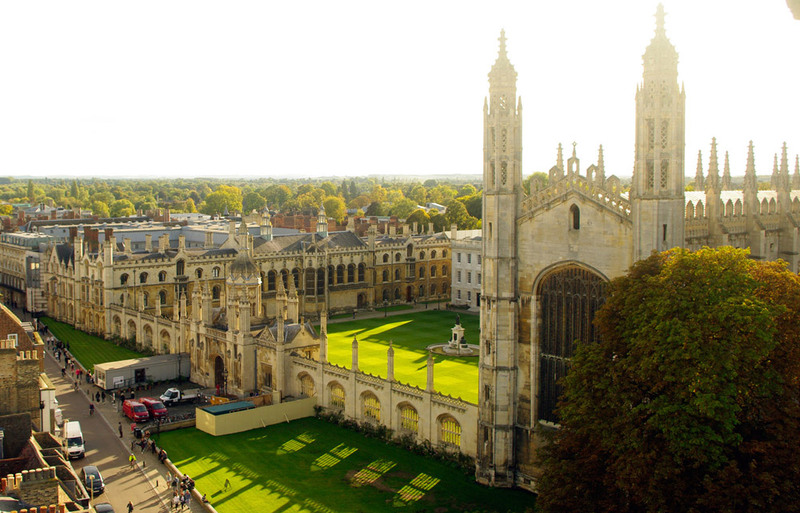 King's College in Cambridge - a university city, Oxford and Cambridge have ancient world class universities with world class architecture. A stately home: There are large historic country houses and estates to be found across Britain, many of which are open to public with the interior renovated in the style and standard that it would have been in its heyday. These often also have large grounds with gardens and parkland, sometimes with a farm and a working estate too. The National Trust and English Heritage are charitable organizations that own many of these properties. There is a charge to enter, if you intend to visit several it is well worth buying an overseas visitors pass or annual subscription, there are also a number of reciprocal arrangements with similar organizations in other countries so you may be able to use the membership you already have back home. If you're looking for the fictional "Downton Abbey", Highclere Castle in Hampshire played that role, there are also others that have appeared in movies and tv programmes. Highclere Castle, Hampshire - played the role of the fictional "Downton Abbey" in the tv series. Well preserved stately homes can be found across Britain and give a taste of what life was like both upstairs and downstairs. Performing arts events, theaters, concerts, festivals: The performing arts and theatre scene in Britain is very vibrant. The theaters of the The West of London along with Broadway in New York are considered to be the highest quality of commercial theatre in the English speaking world. There are always many plays and musicals on at any given time and they change regularly, so there is almost certainly going to be something on that interests you. If your interest is classical music, there are the "Proms" every summer for about 8 weeks from late July where you can see daily performances of concerts at the Royal Albert Hall in London and to a lesser extent at other venues around London and some other parts of the country. International popular music stars generally play Britain on world tours and we have a great many home-grown stars who play here regularly too. The summer months see a whole range of music festivals from the 5 days of Glastonbury, the world's largest green-field festival to other smaller and more intimate ones usually over a weekend. It might not have been something you thought of as a reason to come to the UK, but it's worth seeing what's on while you're here to add another great experience to your trip. Shakespeare's Globe Theatre - on the bank of the Thames in London. Whether it's Shakespeare or something more modern, in a traditional or an up to date setting, London's theatres have all choices covered. Fish and chips - preferably by the sea - Best bought from a fish and chip shop and one with a queue at that. Avoid buying them in non-seaside tourist areas, especially if there's a Union Flag in the window and avoid places that sell anything and everything, pizzas, burgers, kebabs etc. Pubs can do good fish and chips, in restaurants they can be a bit too "cheffy" for my liking, need dismantling before you eat them and are overpriced. 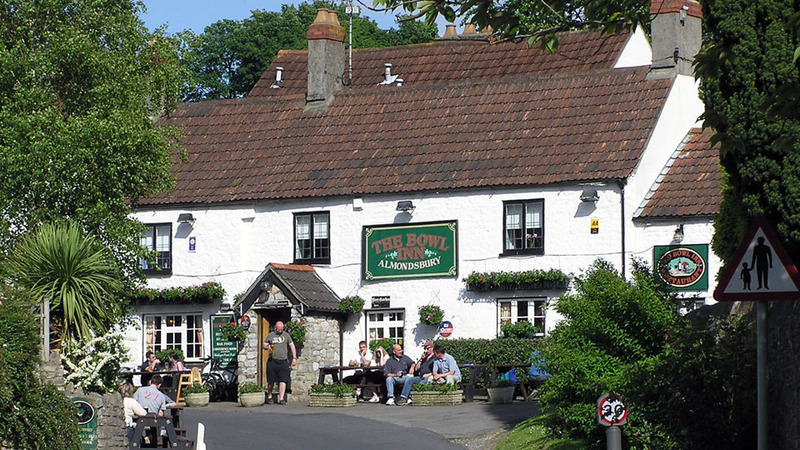 A pub meal - Pubs can provide good quality food with an authentic ambience amongst the tables and drinkers or may have a separate restaurant area, they are generally more relaxed than non-pub restaurants. You can also have a couple of extra drinks at the bar afterwards. In the summer sit out in the garden if they have one. A roast dinner - When most people couldn't afford meat very often, it would be served on a Sunday, simply cooked by roasting alongside seasonal roast and/or boiled root vegetables and greens and served with gravy. Sometimes called a Sunday Roast or Sunday Lunch whatever day it is. There are so many non-meat ingredients that it is often popular with vegetarians too. Roasts can be had in a great many places, on Sundays pubs will often serve a range of roasted meats and wide range of vegetables in a buffet style for less cost than the normal menu, this is may be referred to as a "carvery". A full English breakfast - Probably the easiest thing to find here as your overnight accommodation will almost certainly have this as a breakfast option. It is pretty substantial, so I don't usually bother much with lunch after this start to the day. For variety try kippers, smoked fish with quite a strong flavour if they are available. 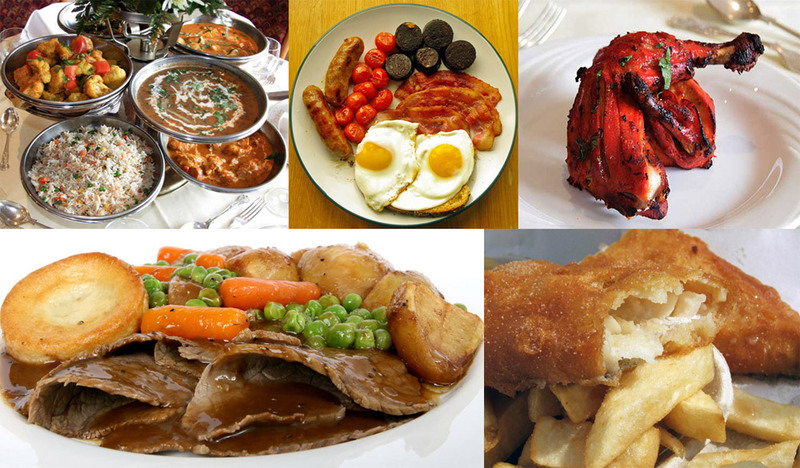 The full English, Welsh, Scottish or Ulster Fry, depending on where you are, can also be found at many cafes, cheap restaurants and even pubs up to about 11am or sometimes all day to about 5pm. Curry - Britain's favourite spicy food is overwhelmingly Indian, served at about 20% of all restaurants in Britain. You could look for Thai or Mexican if this is what you prefer, but the chances are you'll be somewhat disappointed, instead go for one of the options at the nearest well regarded "curry house". The chances are unless you've actually been to India, this will be the best Indian food you'll have tasted. Tea, the British way - You have to try this when you're here, though I accept it is probably one of those things you have to grow up with to regard it as an indispensible part of life. By default the tea is black and almost universally drunk hot and with milk, I have seen cold tea for sale but I can't remember ever seeing anyone I know drinking it. Tea is a universal panacea for any ills, it is an ideal way to punctuate the day and just slow down for a bit, it is the preferred method for millions to start their day, every day. Tea is the perfect accompaniment to a full English breakfast or fish and chips, there are endless biscuits available to dunk it and there is a whole power station at Dinorwig in north Wales that keeps the electricity flowing when loads of people make a cup of tea at the same time. Real ale - Traditional British beer is mostly known as bitter though there are other ale types, it's not so cold that you can't taste it (a good thing for most beer that is served icy cold) and it isn't warm. It should be served at cellar temperature, about 10-12C on draught, pulled by a hand pump at the bar from a barrel, and drunk by the pint close to where it is brewed. There are many different kinds and it is something of an acquired taste though I do encourage you to acquire the taste, it's well worth it. If you're not sure what to get as a beginner, ask the bar person for guidance. Listen to BBC radio - No ads! - The BBC is a well loved institution for good reasons, driving or doing stuff around your hotel room are good times to turn the radio on and see what it's about, there are 4 national stations. Radio 1 is music for a young audience, Radio 2 is music for an adult audience, Radio 3 is classical music and the arts, Radio 4 is spoken word only, news, plays, current affairs, magazine programmes etc.